At Eastern Michigan University, you will find a campus that is small enough to be truly welcoming but large enough to offer many opportunities for study, research, and growth. 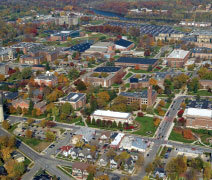 Eastern Michigan University is located in Ypsilanti, Michigan, 20 minutes from the Detroit International Airport. * EMU charged tuition at approximately $413.60 per credit hour for the 2018–2019 academic year. The above example is based on a student taking 24 credit hours per academic year, the minimum required for full-time student status and visa sponsorship. Application Deadlines and Fees: To submit an application, visit emich.edu/apply. Use fee waiver code INTL to apply for free! Deadlines, checklists, and application instructions can be found at emich.edu/international. 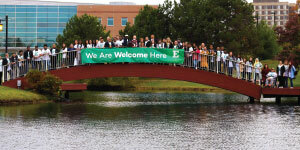 When you join Eastern Michigan University, you’ll join an international community of scholars and leaders. Ypsilanti is a culturally diverse community offering rich tradition, neighborhood shopping, museums, and unique annual events. Just minutes from town, you can find golfing, mountain biking, canoeing, and hiking. Campus is located 10 minutes from downtown Ann Arbor and 45 minutes from Detroit. From Depot Town to downtown Detroit, there’s culture in every direction. Living on campus puts you among your peers in the center of it all. Be within steps of fantastic dining options, recreational and health facilities, and the Student Center. From traditional residence halls to fully furnished apartments, from themed living and learning communities to suite-style rooms, living on campus gives you the full Eastern experience. There are more than 20 on-campus dining locations, including an all-you-care-to-eat dining hall. Additionally, there are many options for students who are vegetarian and vegan or have other dietary restrictions. Going to college is all about exploring your interests. No matter what you’re interested in, you’re likely to find people who share your passion. Learn about particular fields of interest, develop new skills, network with faculty and staff, make friends, and have fun. With more than 200 student clubs and organizations, there is something for everyone, from intramural sports and academic honor societies to community service organizations and cultural identity groups to music and arts and Greek Life. Also, connect with the International Student Association and the Office for International Students and Scholars. Contact us at emu_international@emich.edu with any questions. We hope to meet you soon! In-state tuition for all undergraduate international students! As part of EMU’s commitment to educating students in a diverse and welcoming environment, EMU will no longer charge international students out-of-state, non-resident tuition. Effective fall 2018, all new international undergraduate students will pay in-state tuition. There is no out-of-state tuition for undergraduate students—domestic or international.